Actress Hilary Swank isn't the only one who wants to ride a terra-ship to Earth's molten center. On the heels of Swank's Hollywood thriller, "The Core," a California researcher is proposing to send a probe that would surf a wave of molten iron on a weeklong journey to the center of the Earth. CalTech geophysicist David Stevenson knows his proposal is far-fetched. But billions of dollars are spent exploring space every year, he says, and the planet's interior is equally mysterious and deserves similar study. The Earth's core, after all, creates the magnetic field that keeps compasses pointing north and deadly radiation in space from reaching the planet's surface. Scientists know from seismic data that the core is solid, and the outer core is molten, but many questions remain. "We will learn about the Earth, the planet we live on, the composition of the Earth's core, the temperature of the Earth's core. These are among the most exciting questions," said Stevenson, whose proposal appears in Thursday's issue of the journal Nature. "They have implications for why we have a magnetic field, why the magnetic field has existed for so long." The process of getting the probe to the center of the earth would resemble a volcano in reverse, Stevenson said. The grapefruit-sized probe would have to be made of a special alloy that could withstand the molten iron as well as the intense pressure and heat at the center of the Earth. The iron - enough to fill an office building - would find its way 1,800 miles to the outer edge of the molten core through a gravity-driven crack, started by a nuclear bomb or other force equaling an earthquake of 7.0 on the Richter scale, the CalTech researcher said. 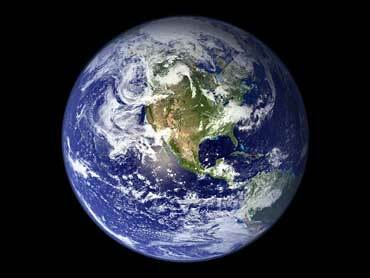 The center of the planet is about 3,950 miles from the surface. The probe would send information back to the surface by emitting high-frequency seismic waves, Stevenson said. Developing a probe would take an effort similar to the Manhattan Project that built the first atomic bomb during World War II, said Stevenson. While that may not happen, the researcher said he hopes the proposal makes people think of new and better ways to study the Earth's core. Other earth scientists say Stevenson's plan is impractical, but intriguing. University of Connecticut geophysicist Vernon Cormier said intense heat and pressure makes it impossible to drill down to the core. Stevenson's proposal "allows the hole to keep open because it is not really an open hole or an open crack - it is a crack filled by a fluid that is denser than its surroundings." That density difference would allow the crack to continue to sink while sealing above itself, Cormier said. However, the Comprehensive Test Ban Treaty bans all underground nuclear tests, he said. The United States has not ratified the treaty, but the Threshold Test Ban Treaty with the former Soviet Union and other nuclear powers limits tests to below 150 kilotons, or about a 5.5-to-6.0 earthquake, Cormier said. A more achievable goal would be adding deep-sea seismic stations to fill in holes in the current global network, Cormier said. "If we had the same kind of coverage of the ocean ... we could learn quite a bit. It would still be very expensive, but a fraction of the cost," Cormier said. Current top-down methods of studying the Earth's core don't have the resolution needed to obtain basic information about its composition, temperature, and flow, said Raymond Jeanloz, a geology professor at the University of California at Berkeley. While there are many unanswered questions, "I can think of current high-profile government research programs that have little more substance motivating them," Jeanloz said. Stevenson recognizes that elements of his proposal are futuristic. "I'll be happy even if people just think it's funny," he said, "but I'll be happier still if some people take it somewhat seriously."